Prepare your taste buds for a flavor explosion that's as delicious as it is guilt-free! 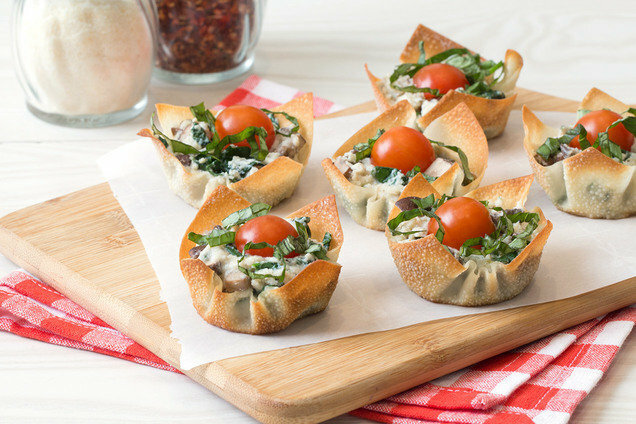 Place each wonton wrapper into a cup of the muffin pan, and press it into the bottom and sides. Lightly spray with nonstick spray. Bake until lightly browned, about 6 minutes. Meanwhile, in a small bowl, combine ricotta cheese, mozzarella cheese, and seasonings. Mix well. Bring a skillet sprayed with nonstick spray to medium-high heat. Cook and stir mushrooms until mostly softened, about 3 minutes. Add spinach and cheese mixture. Cook and stir until mushrooms are soft, spinach has wilted, and cheese is hot, about 1 minute. Evenly distribute mixture among the wonton cups. Top each cup with a tomato half, and sprinkle with basil. We took the flavor of traditional tomato bruschetta and stuffed it inside actual tomatoes, along with yummy chicken and cheese. Because, why not? In a medium bowl, season chicken with Italian seasoning, salt, and pepper. Add vinegar and garlic, and toss to coat. Slice tomatoes in half widthwise. Using a spoon, carefully scoop out and discard the inside flesh, leaving the hollow tomato halves intact. Place a tomato half in each cup of the muffin pan, cut side up. (If tomato halves do not sit straight, cut a thin slice from the bottom to form a flat end.) Thoroughly blot away excess moisture. 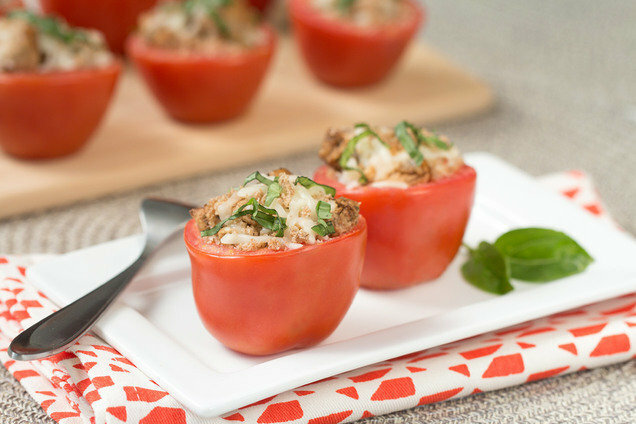 Fill hollowed tomato halves with chicken mixture. Top with mozzarella and panko breadcrumbs. Bake until cheese has melted, about 10 minutes. Hungry for More Savory Muffin-Pan Recipes? Today, June 9th, is National Strawberry-Rhubarb Pie Day. Celebrate with this Strawberry Pretzel Pie... what it lacks in rhubarb it makes up for in deliciousness. Click "Send to a Friend" ASAP -- your pals will need time to hit the grocery store before dinner!